The Duke and Duchess of Cambridge have welcomed their third child (Louis Arthur Charles) into the world! 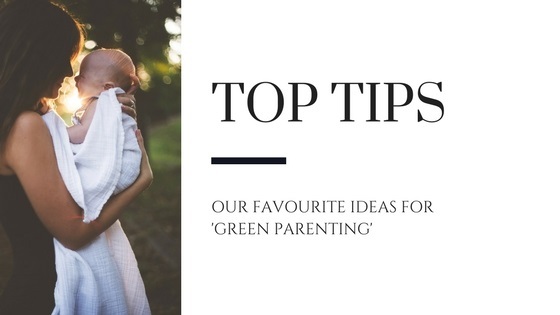 We thought it would be the perfect time to share some green parenting tips! While there's no denying that disposable nappies probably make life much easier for a lot of parents, people used to manage just fine with reusable ones that didn't get sent to landfill. Of course, it does mean that you find yourself with more washing, buuuut, it could also save you money in the long run even if you only use them on days when you stay at home. It all makes a difference. For obvious reasons, a lot of things designed for children are made of plastic, from the cups they use to the toys they play with. Of course, that is much safer than letting them use breakable things, but try and buy as many wooden toys as possible to reduce your plastic waste. The woodentoyshop.co.uk sells a huge range wooden toys. When you go on family trips to the beach, make it a game you play to pick up 3 pieces of plastic each and take them home to be recycled. Many of us probably had at least one plastic sippy cup that we took everywhere with us when we were a kid, but ditch the plastic and swap it for a stainless steel one instead. They come in a range of different shapes and sizes so you may want to buy more than one to see which your child prefers. This one might sound obvious, but try and hang on to as many of the ‘big essentials’ as you can if you think you might want to have more children. Things like highchairs and pushchairs can be expensive to buy, so if they’re in good condition by the time you’re finished with them (not always easy with kids, we know) hang onto them or pass them on to friends and family who might be able to make use of them. This counts for clothes too. There’s no denying that children go through a lot of clothes, whether it’s because they keep having growth spurts or because they get messy. Try and donate or pass on any clothes than could be reused to your local charity shop or someone you know. You could even let your kids use them for playing with to dress up dolls or teddy bears. These are just some of our tips - we’d love to hear yours too. It isn’t always easy making lifestyle changes when you’re trying to raise young children so don’t beat yourself up. After all, perhaps the best thing you can do is teach your kids about the environment and why we need to look after it.